A 20-month-old male infant presented with two episodes of focal seizures, each lasting 4 minutes and consisting of staring, lip and teeth clenching, and eye deviation to one side followed by stiffening and jerking of all four limbs. He had an antenatal ultrasound finding of an intracranial cyst. The pregnancy was otherwise uneventful and delivery and early development were normal. He had a past history of two febrile convulsions associated with upper respiratory tract infections. Electroencephalography showed normal background rhythms visible at times but the recording was dominated by runs of high-amplitude rhythmic sharpened slow waves most prominent in the right lateral leads and bi-frontally. 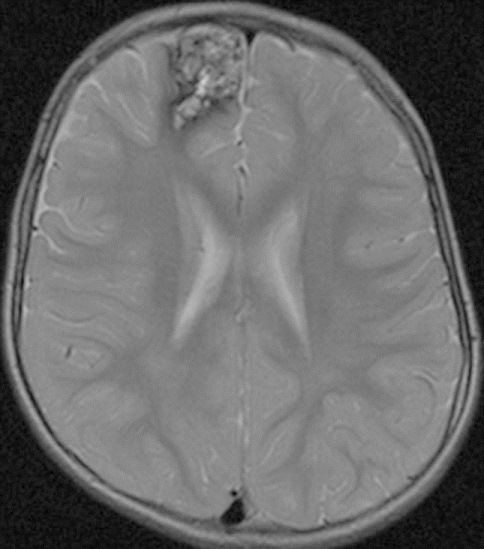 Magnetic resonance imaging (MRI) [Figure 1] showed a right frontal cavernous haemangioma with typical, popcorn-like, smoothly circumscribed, well- delineated complex lesion features. The core is formed by multiple foci of mixed signal intensities representing haemorrhage in various stages of evolution. His seizures were refractory to initial management with carbamazepine and the angioma was resected. He continued to have seizures following resection. 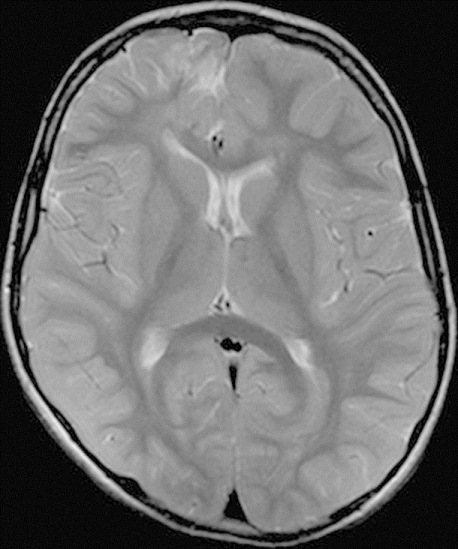 Repeat MRI brain at age 4 years showed a new cavernous angioma [Figure 2]. Genetic analysis showed a c.845 + 1 G > C heterozygous transversion mutation of the Krev interaction trapped 1 (KRIT 1) gene. Multiple CCMs are associated with autosomal dominant genetic mutations. Three genetic loci have been found: CCM1 and CCM2 on chromosome 7 and CCM3 on chromosome 3. The KRIT1 gene is a gene located within the CCM1 locus on chromosome 7 encoding the KRIT-1 protein. Mutations identified to date mostly cause a premature stop codon resulting in a lack of KRIT-1 protein. Some evidence has been found for a role for KRIT-1 in the early development of blood vessels. CCM1 knockout mouse models  have demonstrated that CCM1 is expressed early in embryogenesis and is essential for vascular development. KRIT-1 has been found to be expressed in endothelial cells  and in particular during early angiogenesis. In a case series of patients  with multiple CCMs, 28% were found to have a mutation within the CCM1 locus. In a second case series  of cases with multiple CCMs or an affected relative, 43% were found to have a mutation within the CCM1 locus. 1. Garcia-Morales I, Gomez-Escalonilla C, Galan L, Rodriguez R, Simon De Las Heras R, et al. Cerebral cavernomas in childhood. clinical presentation and diagnosis. Rev Neurol 2002;34:339-42. 2. Di Rocco C, Iannelli A, Tamburrini G. Cavernomas of the central nervous system in children. A report of 22 cases. Acta Neurochir (Wien) 1996;138:1267-74. 3. Cavé-Riant F, Denier C, Labauge P, Cécillon M, Maciazek J, Joutel A, et al. Spectrum and expression analysis of KRIT1 mutations in 121 consecutive and unrelated patients with cerebral cavernous malformations. Eur J Hum Genet 2002;10:733-40. 4. Whitehead KJ, Plummer NW, Adams JA, Marchuk DA, Li DY. CCM1 is required for arterial morphogenesis: Implications for the etiology of human cavernous malformations. Development 2004;131:1437-48. 5. Gunel M, Laurans MS, Shin D, DiLuna ML, Voorhees J, Choate K, et al. KRIT1, a gene mutated in cerebral cavernous malformation, encodes a microtubule-associated protein. Proc Natl Acad Sci U S A 2002;99:10677-82. 6. Guzeloglu-Kayisli O, Kayisli UA, Amankulor NM, Voorhees JR, Gokce O, DiLuna ML, et al. Krev1 interaction trapped-1/cerebral cavernous malformation-1 protein expression during early angiogenesis. J Neurosurg 2004;100:481-7. 7. Verlaan DJ, Laurent SB, Sure U, Bertalanffy H, Andermann E, Andermann F, et al. CCM1 mutation screen of sporadic cases with cerebral cavernous malformations. Neurology 2004;62:1213-5. 8. Laberge-le Couteulx S, Jung HH, Labauge P, Houtteville JP, Lescoat C, Cecillon M, et al. Truncating mutations in CCM1, encoding KRIT1, cause hereditary cavernous angiomas. Nat Genet 1999;23:189-93. Nahrir, S., Al-Hameed, M.H., Al-Sinaidi, O.A., Shakweer, W.A.